Montebello PD looking for Help to Identify Robbery Suspect. 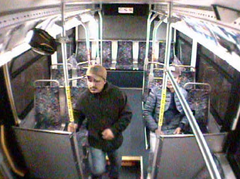 The man in the photo was riding on a Montebello bus traveling northbound on Garfield Avenue near Whittier Boulevard. As the bus began to stop the at a bus stop, the suspect grabbed a backpack from a person seated on the bus. The suspect and victim struggled over the backpack until the victim was forced to let go. The bus driver tried to detain the suspect in the bus by locking the doors. The suspect knocked out an emergency exit window and escaped the bus.